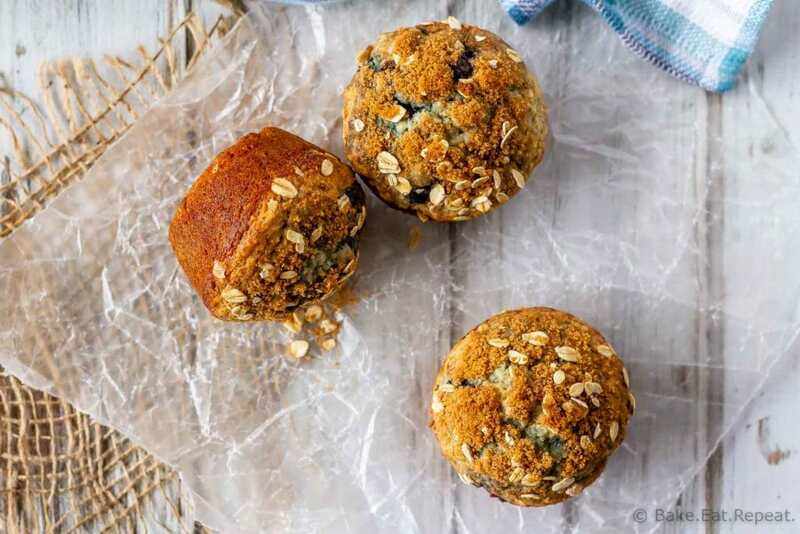 Enjoy a healthier blueberry muffin with these blueberry oatmeal muffins – filled with oats and blueberries, and less oil and sugar then your typical muffin! We go through muffins at a rather alarming rate here. I have three kids, and I don’t think they’re ever not hungry. This is probably fairly common. Growing children and all. I suppose it makes sense that they’re always hungry. But it does seem like the snack food disappears as fast as I can make it. I think muffins actually disappear even faster then any other snack food. That’s likely because my husband and I also really enjoy muffins. So when you have five people that all happily grab a muffin for breakfast or a snack – the batch of 12 does not last long. Especially when they’re delicious muffins like these apple muffins with crumb topping, or these apple cinnamon muffins. 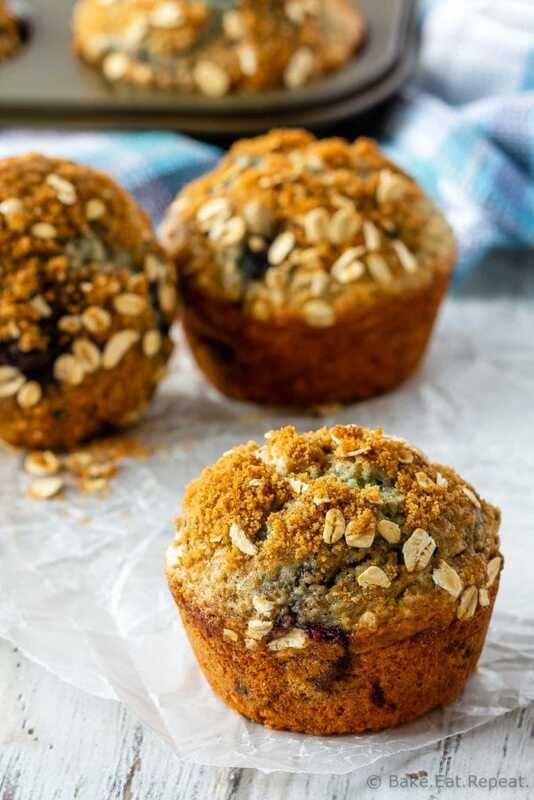 We have been making (and loving) these blueberry oatmeal muffins for years now. They’re light and fluffy and filled with blueberries, and they’re healthier then your typical blueberry muffin. Well, your typical jumbo, bakery style blueberry muffin probably isn’t. Those tasty bakery style muffins usually have quite a lot of sugar in them, they only use white flour, and they probably have a fair bit of oil or butter in them as well. They’re delicious, but not healthy. 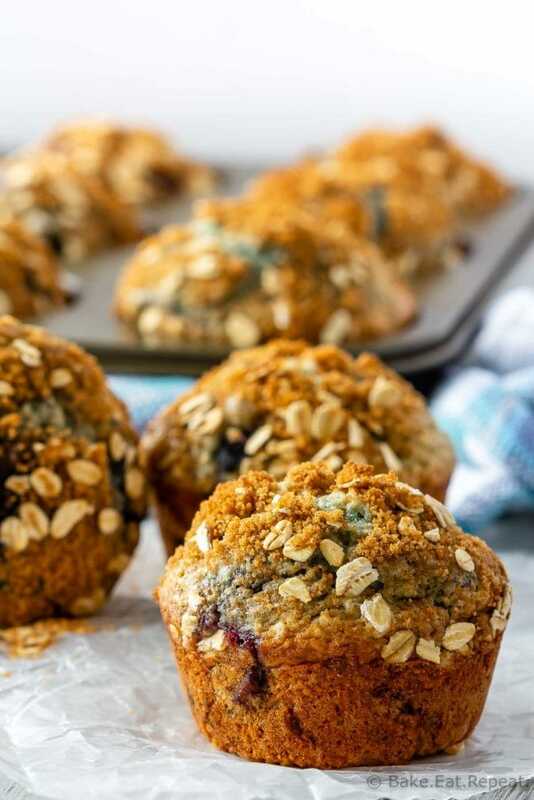 These blueberry oatmeal muffins use oat flour for some of the flour to make them a little heartier. Plus you can replace the all purpose flour in them with whole wheat flour to make them even healthier. They also use less sugar then most muffins do, and hardly any oil. Greek yogurt is added for more moisture without increasing the oil. You can also skip the brown sugar topping to make them healthier – they’re still delicious without it. Yes! I almost always use frozen blueberries in my blueberry muffins. I usually have them on hand, and truthfully – fresh blueberries cost more and disappear in minutes here so I rarely bake with them. Don’t thaw your blueberries before using them, fold them into the batter frozen. Tossing the blueberries with a bit of flour before folding them into the muffin batter helps them not to sink to the bottom of your muffins. Is it better to use fresh or frozen blueberries for muffins? It really doesn’t matter. I usually use frozen, but if you prefer fresh blueberries, go for it! With frozen blueberries you will have a little bit of colour bleeding into the batter. Even if you fold them in gently while still frozen and don’t over-mix, there will still be some purple swirls in your batter. If that bothers you, then you will want to use fresh blueberries to avoid this. Make sure not to over-mix your muffin batter. Over mixing the batter can result in tough muffins rather then light and fluffy ones. Stir just until everything is combined. If you don’t have oat flour on hand (I never do), all you need to do to make it, is give some rolled oats (or quick oats) a quick whirl in a food processor or blender to grind them into flour. Make sure to measure the flour after you grind the oats, not before – 1 cup of rolled oats will yield approximately 3/4 cup of oat flour. 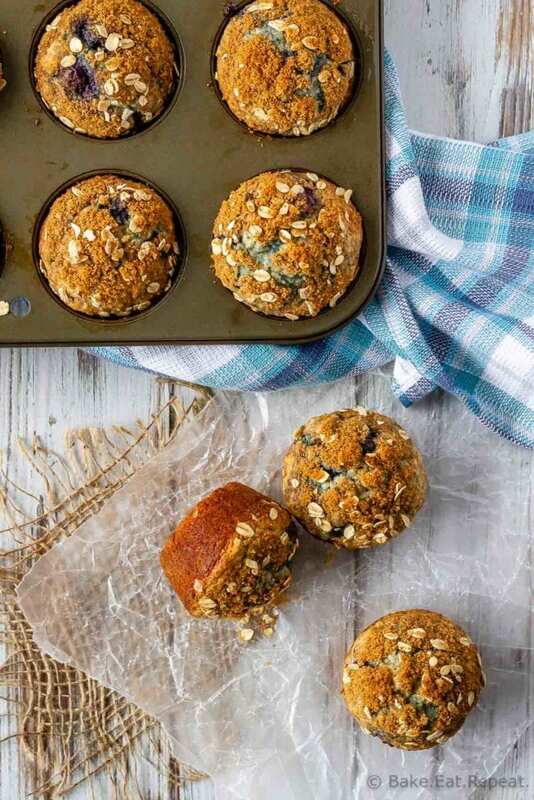 There isn’t a lot of oil in these muffins, so you will want to make sure to spray your muffin tin with non-stick cooking spray, or your muffins will be difficult to get out.